JOIN US ON DECEMBER 14! 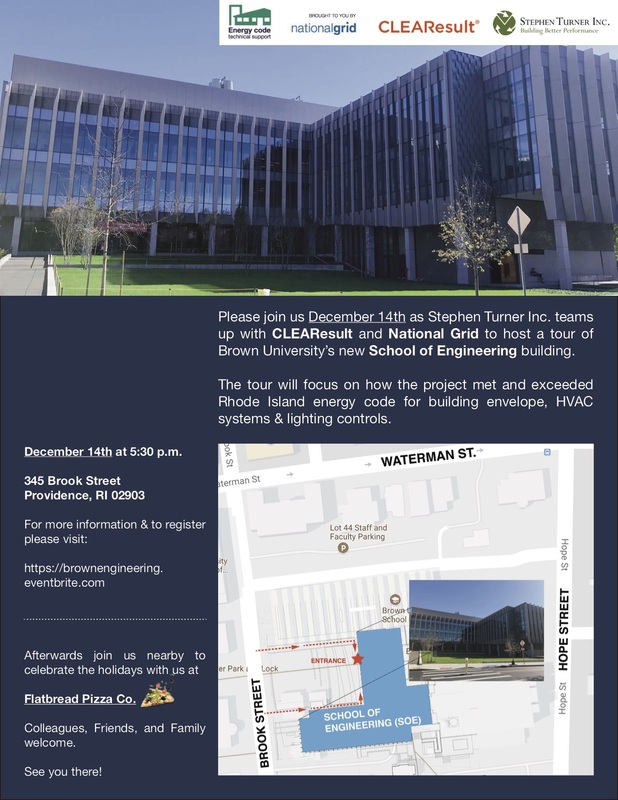 TAKE A TOUR OF BROWN UNIVERSITY’S NEW SCHOOL OF ENGINEERING BUILDING FOLLOWED BY A HOLIDAY CELEBRATION AT FLATBREADS PIZZA CO.
Join us as we team up with National Grid to host a one-hour tour of Brown University's recently opened new state-of-the-art School of Engineering building. The tour will focus on how the project met and exceeded Rhode Island energy code for building envelope, HVAC systems and lighting controls. Take the tour, then stop over to Flatbread Pizza Company for our annual Holiday party for food and refreshments with the Stephen Turner Inc. team. Family and friends are welcome!